Some of you may recall that I've been experimenting with vertical gardening solutions using epiphytes, and I've finally finished my first installation! I've seen some amazing succulent wall art via Flora Grubb, but most succulents require more sun than my balcony can provide, so I've replaced the echeverias and sedums with cattleyas and rhipsalis! These epiphytic plants are not only shade tolerant, the soil they require is much lighter since its composed of nothing more than an orchid mix that can be found at your local garden center. Besides, you know I'm all about making a virtual rainforest. The planter was a simple plastic frame, purchased from Lowes for about $12. The pockets are angled to better hold soil, but I ended up drilling holes at the bottoms of the pockets for better drainage. You can mount the planters flush against the wall with the included hardware, but since I'll be bringing this in during freezes, I made another modification and bought some shelf brackets for it to rest on. I also used a hook and some wire to firmly hold the installation in place. When we get a freeze warning, I'll simply untie the wire and bring the micro-jungle indoors. I planted the fixture with a tapestry of orchids and epiphytic cacti, and I even added a pink cryptanthus for interest! 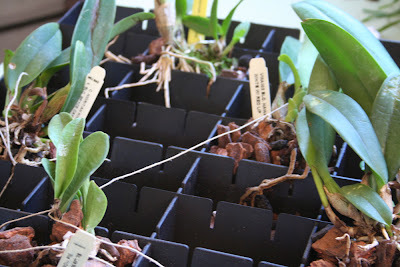 The orchids were mostly cattleya hybrids, but a blooming dendrobium "mini stripe" was added at the top so the stems will reach upwards from the frame. Moss was also covering the substrate with the dendrobium, so hopefully that will spread throughout the planting too! The mass of epiphytic cacti consists of a limited palette of only 4 species, chosen for their fine texture. I especially like rhipsalis baccifera, which hangs down in pendant drapes and looking for all the world like a waterfall. When I water the plants from above, the shower tumbles over the surface and drips down the pendant rhipsalis, falling on the palms and bromeliads below and looking just like a rain shower. No water is wasted, since it gets snatched up by the bromeliads's cup like rosettes before it reaches the ground, making a pitter patter that sounds like the real thing. You could even install a watering system that irrigates the miniature jungle with a lifelike mist... wouldn't that be awesome in the summer?! This was an affordable and easy project, and I really think more people should try this for themselves. Stay tuned and I'll show you guys how I managed to make this wall mounted patch of paradise! Hi Steve – Funny you should mention Flora Grubb, I went to her nursery in San Francisco a couple of years ago – fab place, well worth a visit. Oh, it looks cool. I saw that planter from Lowe's before. I am a little surprised that those angled pockets even can hold the loose orchid mix without the problem. I got to try it some day. That dripping effect of rhipsalis baccifera is really nice. Great job! I can just imagine the sound fo the water dripping down making it seem even more rainforesty! Is this frame made for wall installation? I wonder does it protect the wall surface from moisture? From what Ami said, it sounds like it was made for hanging. I've never seen that item, but I'll have to keep an eye out for it. It does look like a cool project that would look awesome on my front porch or in the Orchid Room, where the bare walls are making me insane. But I fear mold and mildew, as we have a couple of allergic residents here at PITV. I imagine your creation will be so pretty when the orchids all bloom. The addition of the cryptanthus, of course, is the perfect finishing touch. Very nice idea for a small space. I wonder how little humidity such plants can take, though? So cool! You bought the frame at Lowes for twelve bucks?!?! A new Lowes just opened up in SF a couple weeks ago. We have to take a trip and find this cool thing. The new Lowes is pretty darn close to Flora G. too (sorry, but I had to rub it in). Im totally amazed at your wonderful idea. It look simple but I can imagine a lot of fine work in attaching the medium & the plant to stay put in a vertical proportion. Its really a work of art! That is the coolest wall art I've ever seen. The drooping, dripping foliage of that Rhipsalis is just perfect for such a planter. I've not seen these wall planters for sale, but you can bet I'm going to be looking for one. Your interpretation with the orchids and epiphytes is just gorgeous. I can see the whole wall filled with these lush orchids. It looks like you are well on your way to the rainforest and with the potted plants I know it already feels like one. Which is most welcomed this time of the year in my part of the country-ah the lushness, warmth and humidity of the tropics. A welcome thing especially when you add in the all the green. I would say I'm jealous, but I'm even more envious of YOUR garden! I'm sure you got a lot of great inspiration from that visit. Thanks! I've been planning it for a while now. I did use twine to help hold things in place too. In retrospect, I wish that I was able to find a mesh netting to help hold things in place! It was a little tricky getting it all to stay put, but those aerial roots will take hold soon anyways. The dripping rhipsalis is my favorite part! 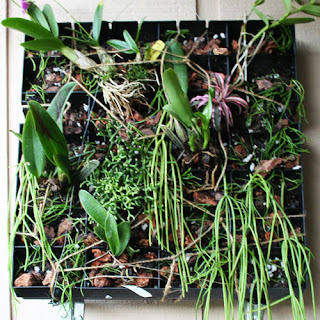 I would love to do one of these with just rhipsalis baccifera sometime. Rainforesty... I like that! You should hear the patter of droplets hitting the leathery bromeliad leaves. Its pretty realistic sounding! 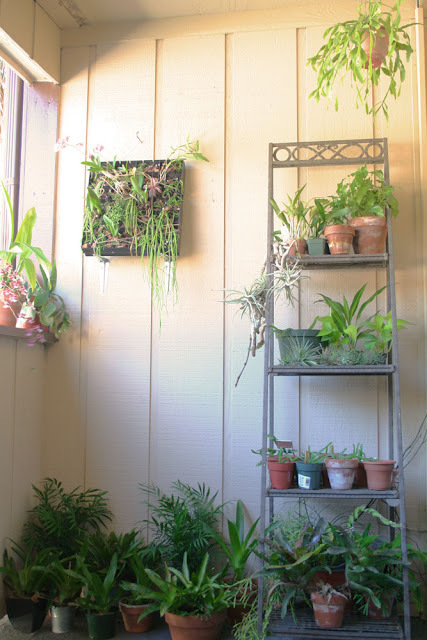 The planter is made for mounting flat against the wall but since I have it on shelf brackets leaning at an angle, the water doesn't get on the wall. 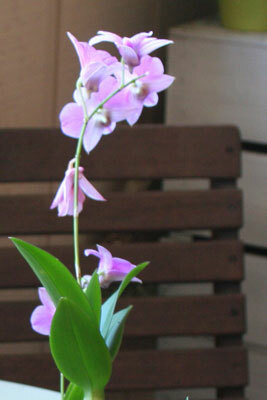 Oh, and it really will be pretty when the orchids bloom since the flowers are really big and they would steal the show! If the rhipsalis and orchids are misted frequently they should be ok, but since you live in the desert you can also use desert succulents like burro's tail! Thanks for rubbing it in! Lowes is nice, but I would never make it over there if Flora Grubb's nursery was there to distract me. Thanks! It actually was a little tricky to carefully place the bark, soil and plants together so they didn't make an avalanche, but they seem to be situated for now! When those roots start coming out I'll be set. Thanks for the kind words! I really love the lushness of rhipsalis and wish more people were turned on to it. Also, orchids always get a bad rap for looking ugly when out of bloom, but I think they look pretty too! I'm glad it reminds you of the tropics! Even if I could afford to fill the whole wall with planted panels, I do kinda like having just one isolated by space like a painting. Have you considered covering your windows with some blankets and installing a heater on your balcony? Love the rhipsalis in there! It just makes the whole thing perfect! You are giving me too many darn ideas! Stop already, will ya??? JK! LOL. Have a great Thanksgiving week ahead! 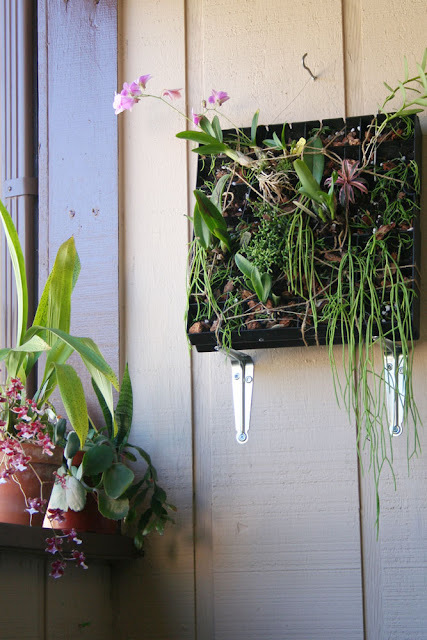 Bromeliads are so natural for this emerging trend in vertical gardening. Growing vegetables on my walls and hand rails is more my thing, and I look forward to the day when people everywhere step out their doors and harvest salad from the sides of their houses. Very neat! 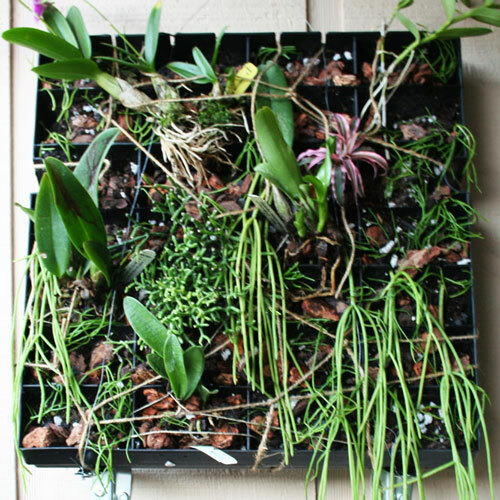 Speaking of Flora Grubb and vertical gardens...this might be of some interest....a vertical garden for your desk.